Literally the word refers to the act of reducing or removing regulations, or rules, by which governmental bodies direct or control activities, often business activities. In some instances it is portrayed as an effort to reduce or eliminate red tape, or overly complicated, sometimes very technical, rules that govern behavior of companies and entire economic markets. In other instances, and increasingly these days in the EU and US, the term is used as code for undermining any involvement by governmental agencies in controlling or even affecting economic activities of businesses. In this later sense, it rises, or falls, to the level of an ideology that embraces free-market economies and revolts against governmental oversight, arguing that businesses know better than governments how to run their businesses, and how to maximize profits, which they believe are harmed by any regulation. This vision of deregulation, at its most reactionary extreme, would do away with any rules including worker and consumer protections, health and safety standards, and, best of all, any taxes. It is reactionary as it would turn back the clock so that the economy, workplace, and consumer markets would return to how they operated in the 19th century. Read Charles Dickens. Environmental regulations in particular draw the wrath of free-marketers. But some, even many, businesses and industries are more progressive and accept that environmental and other regulations are necessary to protect citizens and consumers. What they want is consistency of treatment through the application of any regulations and certainty in the rules so they know what they have to do and not do, and can know that the rules are not going to be arbitrarily changed. Recent changes in the composition of the European Commission reflect a growing deregulation agenda similar to what happened under President Ronald Reagan in the 1980s in the US. Can you identify any environmental regulation that has subjected people to increased health risk? The banking systems in many countries were deregulated over the past several decades. How did that work out? 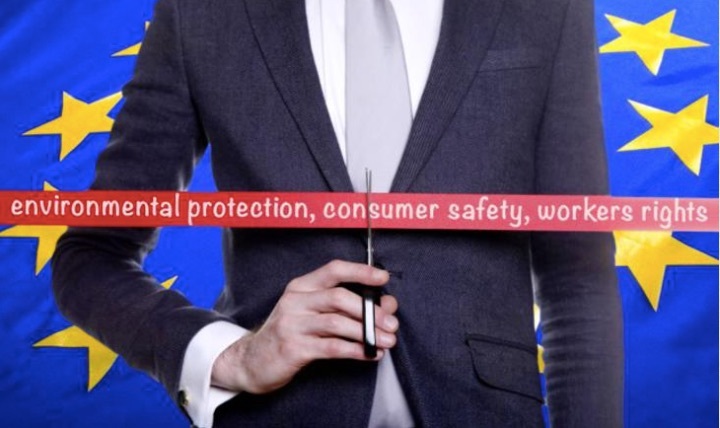 How can you differentiate an independent, objective effort to cut red tape, meaning overly complicated and technical rules, and extreme deregulation, designed by and for businesses to reduce their costs and improve profits irrespective of adverse impacts on the environment, health and safety protections? “Business in the US Is Becoming Climate Riskier, But At What Cost?” in the Reports section of the current, March, issue of irish environment.